Yes, that is most excellent work. What will the suspension be like and how will it hang? But this is not for shure as the swords often were found in a funeral burial and the metal parts survived only as a lump of parts which are not certainly understandable. The celtic variants of this type of sword seem to have been carried at a sword-chain, maybe some of the corroded pieces of metal in the lumps belonged to similair sword chains, though they seem to have been uncommon in Germania. BTW: I left the hammered surface of the scabbard even if I strongly believe in a very fine surface finish of the iron scabbards. But this "forge-finish" has a very special look, also I left the special finish of the polished scale on the blade, it gives a very ancient look of this sword. Sad, but the pics don´t show the light reflexions on the blade and scabbard right. It really looks great! You know what Christian, if you watch Warriors with Terry Schappert: Barbarian Massacre you can see how your country looks like during Arminius' time. 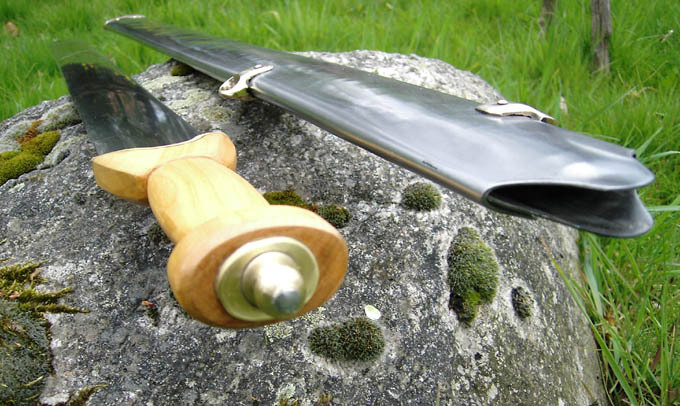 Host Terry Schappert even battled reenactors dressed as Germanic warriors and Roman legionaries in the famed Teutoburg Forest and your famous creation, the Cherusker sword (below) was shown briefly in the program. although I must say, to my taste it was not serious enough (I don´t like to reduce the past on warfare), but that´s what most people want to see...BUT: the sword used in this film and also the sword you can see in the image below are not from Albion´s "Cherusker"-series, they are custom made by my hands in my forge. Warriors with Terry Schappert: Barbarian Massacre is not a movie. It's a documentary produced by the History Channel. Here in Malaysia we do have that channel. I live three kilometers away from the museum of the Battlefield Site of Kalkriese (Battle of Teutoberg forest). I am at home here! And if you have the documentary on DVD you can see our Ironage house (which I helped to build) and I was with the "movie"-shots. Is that enough for you? we will not let it die! i like the first one, but i like the second even better! I must get to powerhammer to break some material i have here and make some of this goodness too! Very nice Robert. I like it. But what really impresses me is what I have seen through the finds of Illerup Ådal, I have been to Moesgaard several times and found blades which were finished so acourate - we both know the octagonal blade from that site, we have had it here at our museum where I am employed in Kalkriese for the time of our special exhibithion 2009! I have done a few lance heads from Illerup to see how this is to be done without modern tools - and I was really shocked when Jörgen Ilkjaer said, they must have done thousands of them inner a few years just to prepare on one attacking of Jutland. At the moment I work on a so called roman spatha from Illerup with octagonal blade...can only show you a small impression of it. I first forged it and then profiled it´s octagonal cross section with a rasp like knife makers would have done it, it was a goddam piece of hard work to do this, now I can make the finish and polish it...But I should have done it from damaskus-steel...but I have to lern much before.. I saw your Åsby-reconstruction at albion and: yes! That meets with the original absolute in any detail! On several comparable finds I have seen some bronze-parts attached to the grip I can not explain myself, maybe we both can some day solve this problem... Good work you are doin there (but I hope the Chasuari will buy my weapons first, hehe ) But you bring this exeptional early germanic weapon-"industry" to a greater public! Tak you for that!! Next images show some pieces I have done: a LaTéne Type lance and a Illerup lance, and an unfinished octagonal Illerup blade, what do you think about it? I realise this is repying to a post QUIE a ways from the past, but I'm just curious about that very jagged and scallopped spear blade, is that one from Illerup or LaTene? and how do we know it was made like that as opposed to it just being a VERY corroded normal lance head? Here is a langsax I made for an archeologist for his PhD, as he wanted to show different ways of reproduction of a piece he had done the conservation of. 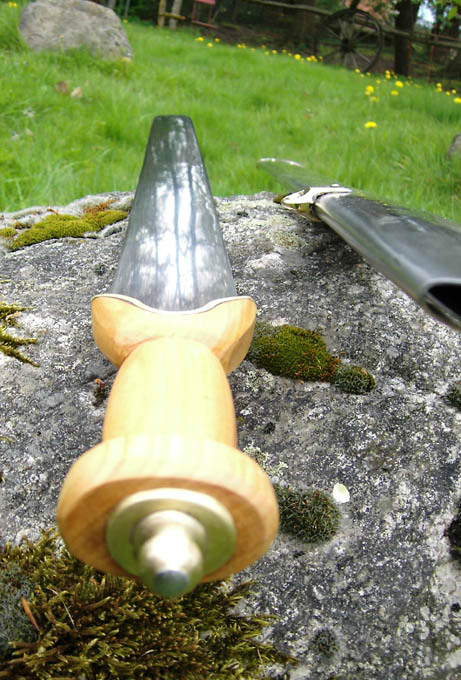 The handle is of a single piece of horn and extends over the blade, as the original data suggests. The horn was deformed to shape using heat, as horn when heated to over 180 degrees celcius loses its "shape-memory" and will remain in the shape it was formed into. I used a vice to crimp the hot horn over the blade, setting the whole thing with boneglue. Then I shaped the handle with file and sandpaper. Christian, this La Tène sword of yours looks a bit strange because its blade is square-pointed just like its scabbard. I am researching Iron-Age scabbards, with emphasis on non-metallic scabbards (i.e., scabbards for non-professional DIY projects). Is this an accurate summary of Iron-Age scabbards? I would appreciate comments and corrections, with very specific references please. Most Iron-Age scabbards were made from bronze (Oakeshott 1960, Ch. 3) or iron (Stead 2006, p. 9), but a small subset of scabbards were made from organic materials (wood and leather). These organic scabbards are the focus of this section. There are significant differences between continental and British Iron-Age swords and scabbards. The Iron Age scabbards that were made primarily from organic materials had a wood core that was wrapped either with a leather cover or metal bands. The scabbard was lined with hair-covered animal hides. A metal locket was wrapped around the throat, on the back of which was attached a metal bracket, but some scabbards had suspension rings instead of brackets. The scabbard was hung vertically from a baldric. A long iron chape was attached to the tip of the scabbard, and could extend up the edges for the full length of the scabbard. The chape often had a bulbous decorative finial at the tip. The chape often held a decorative metal plate on the front of the scabbard. Designs were engraved on the locket and chape plates. Some wood cores were carved from a single piece of wood that was carved with a transverse cross section in the shape of a "C" (Stead 2006, p. 58 and figure 12). 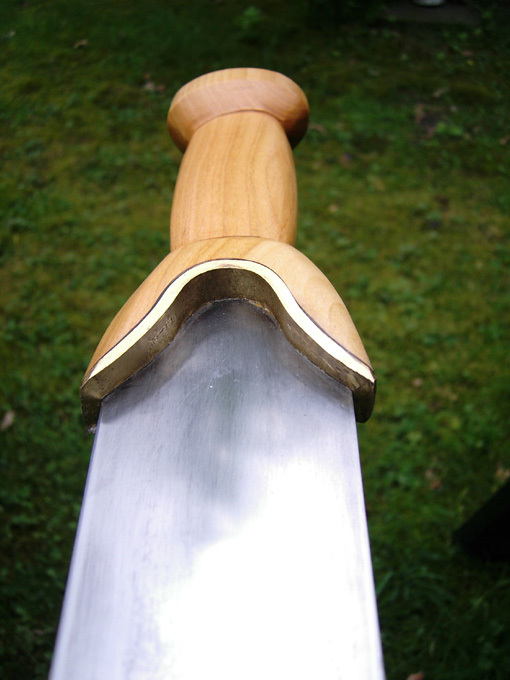 The wood wrapped around the front and both edges of the sword; the back was left open. Alternately, wood cores were made from two long, thin slats of wood that were warped around the sword (Stead 2006, p. 58). Finds of mineral-preserved wood cores show that willow, poplar, ash, lime, maple and cherry were used (Stead 2006, p. 58). Scabbards were lined with hair-covered animal hides (Oakeshott 1960, Ch. 3). The wood core was held together with a leather cover that wrapped all the way around or, alternatively, with transverse metal bands (Stead 2006, p. 58). In the case of the "C"-shaped scabbard, the leather covered the open back of the wood core. The British scabbards generally have a locket with a suspension bracket mounted to the back of the locket (Stead 2006, p. 11 and fig. 5). Some scabbards instead had two suspension rings, one mounted on either side of the scabbard (Stead 2006, catalog #110, 112, 114 and 118). There is no direct evidence to suggest whether a belt or a baldric was used to suspend the scabbard. However, contemporary reliefs from Ninevah and Nimrud in the neo-Assyrian Empire (dated 900-700 B.C.) show scabbards suspended from baldrics (Oakeshott 1960, Ch. 3). Cameron, Esther A. 2000. 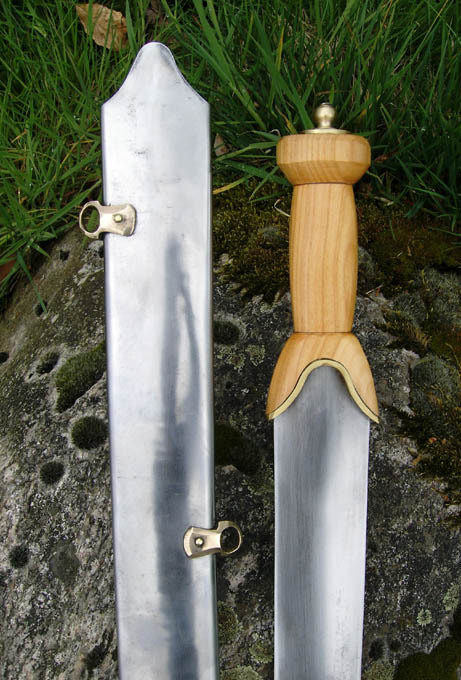 Sheaths and Scabbards in England AD400-1100. BAR British Series 301. Oxford, England: Archaeopress. Oakeshott, R. Ewart. 1960. The Archeology of Weapons. London: Lutterwoth Press. Stead, I.M. 2006. British Iron Age Swords and Scabbards. London: The British Museum Press. The Rudstone La Tène sword showing the remnants of a "C-shaped scabbard that wrapped around the front and edges of an iron sword (British Museum catalog number 1976,0504.17). The back side of the wood core was left open, and the entire scabbard was like covered with leather. Cross-reference with Stead 2006 (sword #186, pp. 188-189 and pl. 8). A La Tène III sword scabbard made from wood (ash) with a metal locket, transverse metal bands and a chape (British Museum catalog number 1952,0202.2). A relief from the Neo-Assyrian Nineveh North Palace, showing a sword hung from a wide baldric and then tucked under a belt (700 B.C. ).